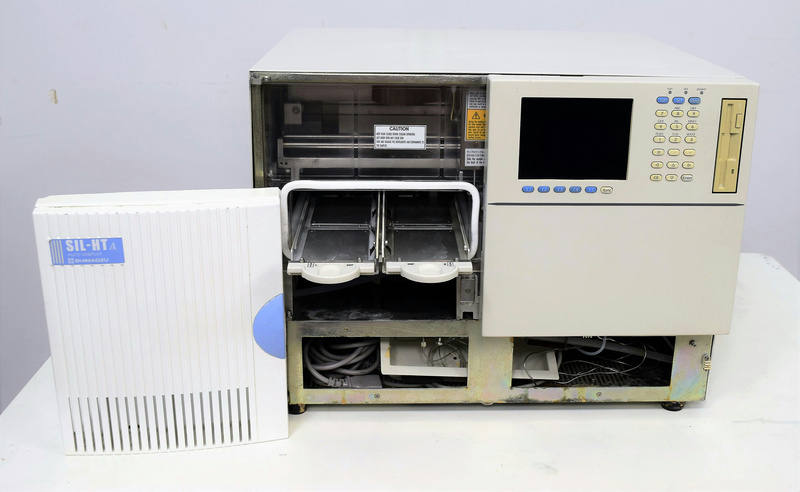 Shimadzu SIL-HTC w/ Temperature Control Autosampler 228-41001-32 Liquid Handler . New Life Scientific, Inc. The product is in fair cosmetic condition and it will be solde for parts, because there are missing panels and functional testing was inconclusive. New Life Scientific technicians inspected and tested the autosampler. The product powers on, passed self-tests, the robotics moved, and the pumps responded. The door was broken upon arrival and swapped with an HTA's door. The bottom panel was missing and it appears that there might be absent internal parts. This product will be sold for parts / in need of repairs, because the technicians think it is incomplete for application. The SIL-HT maximizes analysis throughput with fast sample injection and high sample capacity. Injection speed is 15 seconds for injecting samples of 10µL. The SIL-HTC has sample temperature control from 4 to 40C. *There is no warranty expressed or implied. Powers up and goes through self test, but missing some parts.